The abba Bead Breaker is a one person operation, motorcycle tyre bead breaker that will break all motorcycle beads on tyres up to 200 section. Operated by a screw thread handle it makes light work of breaking even the toughest of beads, With direct internal pressure via the screw thread this eliminates the struggle caused by most lever operated bead breakers on the market. A rubber pad on the base of the bead breaker protects the paint on the wheel rim. It has a durable powder coated finish, and will also work on some car/quad tyres. Unique screw thread design provides much greater force than lever operated style bead breakers. Rubber pad to protect paint on wheel rim. Will break beads on tyres up to 200 section. This product is superb! no more sweating for me. Highly recommended. What size wheel can the abba Bead Breaker accommodate? The abba Bead Breaker will fit all tyres up to and including 200 section. 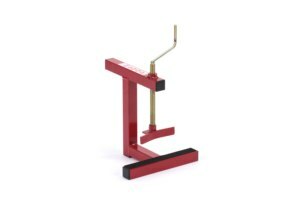 Can I use the abba Bead Breaker on ATV and Car tyres as well? Yes, as long as the tyre is not wider than 200 section as above. Does the abba Bead Breaker come with instructions? Of course. As with all abba products full instructions are provided. Does the abba Bead Breaker come with a guarantee? 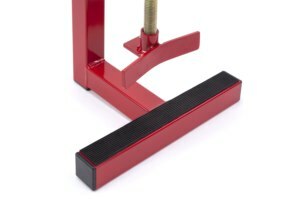 Got a Question about the abba Bead Breaker? If you would like to ask us a question about the abba Bead Breaker, simply fill in the form below and we will contact you within two working days. Want to tell a friend about the abba Bead Breaker? Alternatively fill in the form below and we will send an email on your behalf to your friend, with a link to this page all about the abba Bead Breaker.